A 16-year-old boy has died after taking a suspected drugs overdose at a Halloween rave in Conwy county. The death has led North Wales Police to urge anyone who took drugs at the event at Gwytherin, near Llanrwst, to go to hospital if they feel unwell. 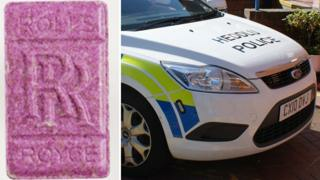 The focus is on pink ecstasy-type tablets with a Rolls Royce-type logo on one side and ‘200mg’ on the other. The boy fell ill during the early hours of Sunday and died at Glan Clwyd Hospital in Bodelwyddan, Denbighshire. Police said ambulance crews notified them at 01:11 GMT on Sunday that the un-named teenager had fallen ill at the music event. “The investigation is at an early stage, but I would urge anyone with information which could assist us to come forward,” added Supt Evans.